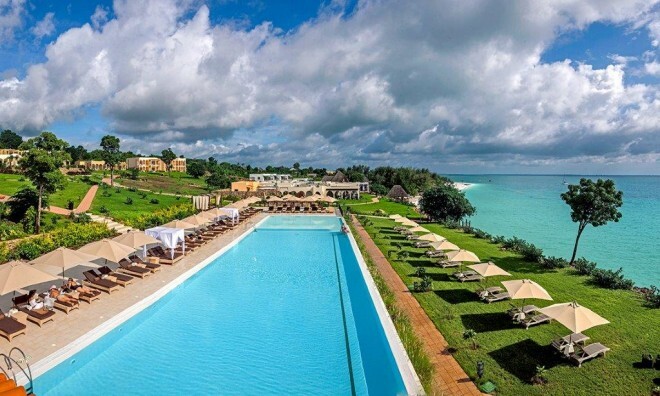 The beautiful Hideaway of Nungwi Resort & Spa is extended over 10 hectares of virgin land on the north west coast of the enchanting island of Zanzibar. This luxury resort in Zanzibar is surrounded by exotic gardens and thousands of tropical plants and wooden steps lead gently down to the beach of Nungwi: an oasis of soft, sandy beach. 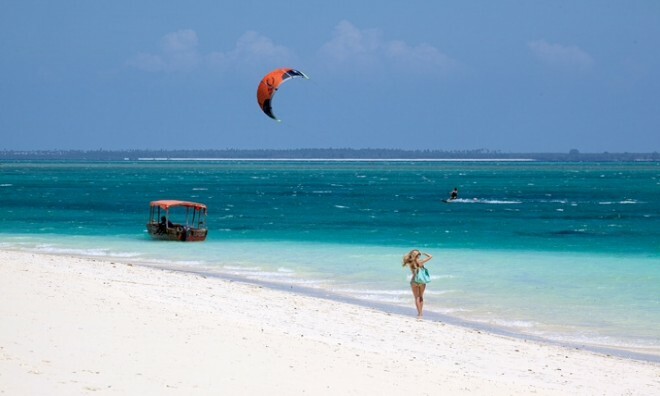 On the north coast of the island, Nungwi is considered to be the most beautiful beach of Zanzibar, where the absence of strong tides guarantees the pleasures of swimming and snorkelling in the crystal, jade sea. The dreamy sunsets of Nungwi are an unforgettable experience. 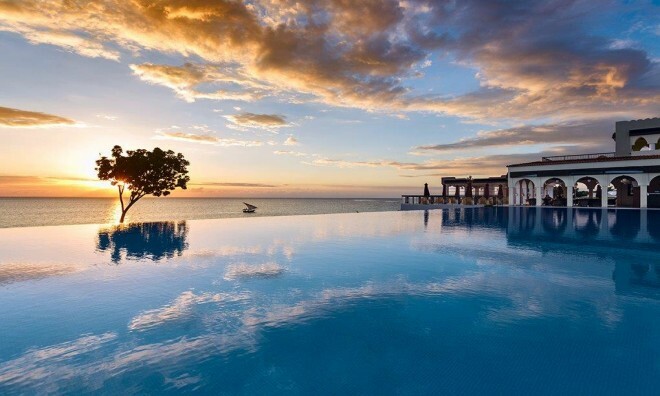 This Zanzibar resort is located just 55 minutes from the airport and the capital of Stone Town, which makes it the perfect place from which to explore the island. There are 100 luxuriously appointed ocean front accommodations, each with a private balcony from where to relish the stunning views of the Indian Ocean and tropical gardens. All suites and villas are purposely built and structured to guarantee a private and peaceful environment and are decorated with contemporary, stylish furniture that evoke the island of Zanzibar's Arabic-African and Colonial heritage. Fresh towels, in-room complimentary amenities including fresh fruits, bottled water, a choice of herbal teas, toiletries, DVD library, chauffeured golf buggy transportation, broadband internet access in each room and WIFI in common areas, modern fitness centre. Hideaway of Nungwi Resort & Spa features both all-inclusive and half board. 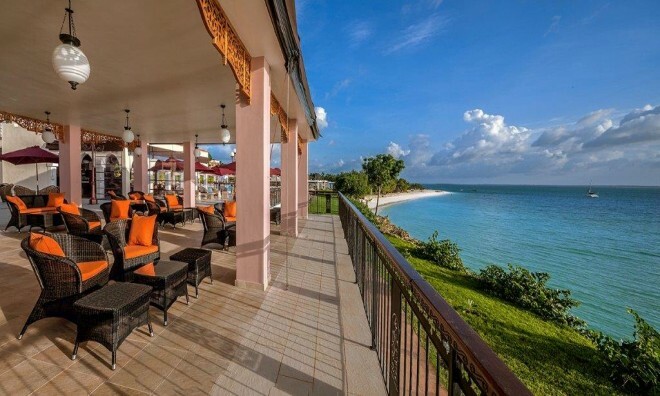 The main restaurant at this hotel in Zanzibar on the north coast is located overlooking the beach and features both indoor and alfresco dining. 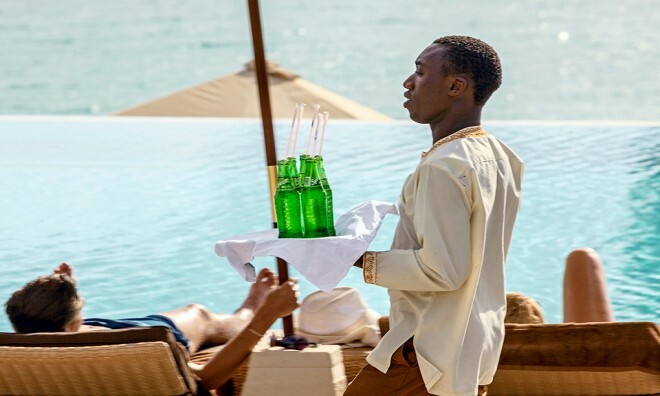 A lavish buffet is available for breakfast, lunch and dinner, making the most of Zanzibar's abundant tropical fruit and vegetables, the myriad range of spices and herbs on offer and the delicious local fresh fish and seafood. This restaurant features the best of Oriental cuisine, including the freshest of sushi and sashimi and a teppanyaki counter at which to dine and watch the chef at work. Specialising in exotic meats cooked to order over charcoal, "Carnivorus and More" offers a taste of all things African. It also offers a range of interesting fish, seafood and vegetarian alternatives. This bar is adjacent to the swimming pool and offers exotic Zanzibari-inspired cocktails and a sumptuous afternoon tea accompanied by a range of Tanzanian loose leaf teas and herbal infusions. This is the perfect place to watch the sun setting over the island of Tumbatu. Featuring a relaxed environment and welcoming couches, the Lounge offers an excellent selection of cigars, shishas, wines and spirits. 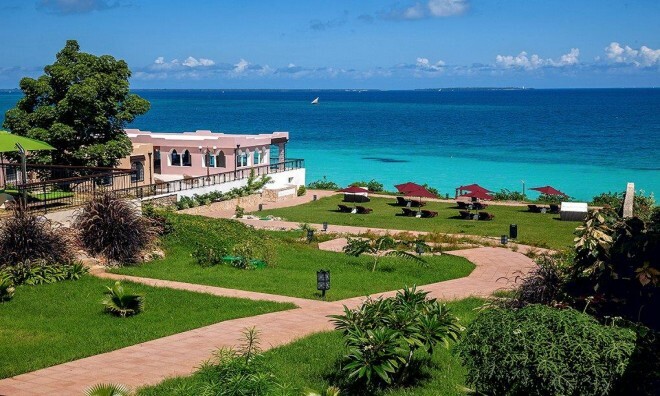 This luxurious Zanzibar beach resort also offers a Kids Club for children aged 4 - 12 years, free of charge. Trained staff will entertain children with different activities, such as cooking and special "mocktail" lessons. Special menus will be served at lunch and dinner. In suite babysitting will be available at extra charge. The Conference Facilities at Hideaway of Nungwi Resort & Spa in Zanzibar are at your disposal for both business and leisure. Lead your body and mind on a journey of outer and inner peace with an extensive and unusual range of spa services that are tailored to your personal needs, such as hammam, hydrotherapy, body and beauty treatments. Also available is a spectacular central relaxation area with Jacuzzi and pool, a fitness centre with personal trainers available at extra charge and yoga classes. A 50m swimming pool (separate children's pool), kayaking, hobie cat, windsurfing and guided tour of the Hideaway Botanical garden with local spices and fruit trees. Evening entertainment includes local and international shows, live music and gala parties by the swimming pool throughout the week. This Zanzibar resort also offers different tours and excursions as well as a Water Sports School. 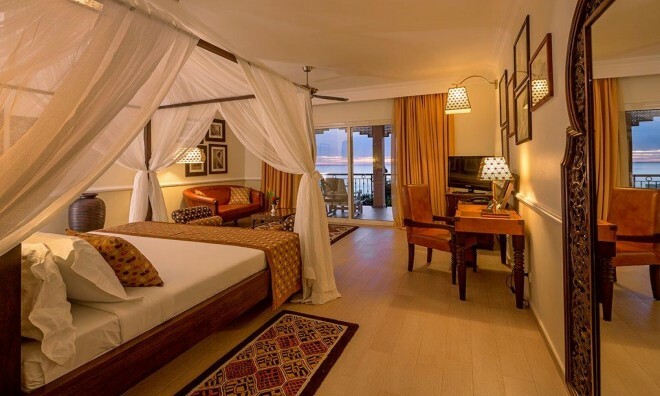 This luxurious hotel in Zanzibar is the perfect place to relax and unwind with stunning surroundings while being pampered like a king and queen. 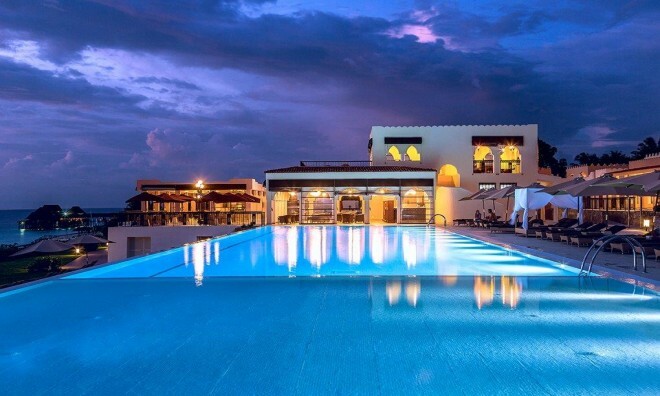 Having been to Zanzibar on a number of occasions over the last few years and knowing the island as we do, we decided to try the newest of the island's hotels. We travelled with a group of friends, some of whom had never experienced the island before. It was our absolute delight walking into a brand new property, being greeted by the most professional and friendly staff ... but looking at the view as we entered the reception, we knew we were off to a good start. Our rooms were beautifully appointed, with such attention to detail in the decor and fittings, the size of the rooms compared to most hotels - worldwide, not just in Zanzibar - are fantastic. The views are simply breath taking and the gardens are very well established for a brand new property having only opened at the end of April. The choice in dining is a treat and we found the meals and variety served in the general buffet area each day nothing short of delectable. The pizza and pasta stations are the cherry on top and one could not but help indulging. The all-inclusive option at this property is a must, the drinks offered on the menu were wide and varied and at no time were we worried that we would end up with an extras bill to break the bank. The beach area and the ocean life is what really does set this property apart. The beach is powder white and soft, not to mention the snorkeling opportunities a few meters off shore. Overall, we spent a fantastic week at this property, we found the staff to be friendly and polite at all times - no matter where we were at any time of the day. The management were always visible and very attentive to our groups needs throughout our stay. We will most certainly visit the property again and have already recommended to a number of fellow traveling friends and family. Great value for money at a true 5 star property in every sense of the word. Why not share your experiences and reviews with the community and write a review for Hideaway of Nungwi Resort & Spa.